The flag of Etobicoke was adopted by the Municipal Council of the Corporation of the Borough of Etobicoke on July 18, 1977 as By-Law No. 4149 (flag version 1977-1995). On January 16, 1995 the Municipal Council of the Corporation of the City of Etobicoke amended By-Law No. 4149 in its entirety and issued the final version of the flag (version 1995-1997). Note: In 1997, the City of Toronto amalgamated, bringing together the former cities of Etobicoke, Scarborough, North York, York and Toronto, the Borough of East York and the Metro level of government. The logo depicts a cityscape emerging from an abstract alder leaf. 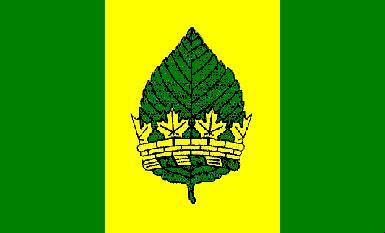 The alder leaf links the current flag to its predecessor and also signifies that Etobicoke is a city rich in green spaces. The cityscape denotes Etobicoke's business and industrial communities. The spine of the leaf denotes the arterial accessibility of the city. The wave depicts the city's waterfront on Lake Ontario. 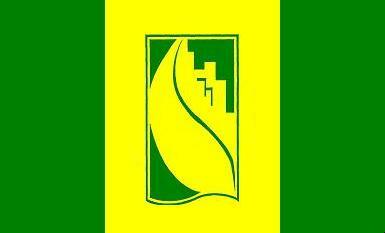 The official colors of the City of Etobicoke are gold (light ochre) and green (forest green).